The weather held to make Sukkahville 2014 a resounding success in raising funds and awareness around the issue of affordable housing in and for our community. The worlds of community and creativity collaborated for the cause. The eight sukkahs reflected the talents of artistic submissions from around the world and signage educated attendees about the shocking statistics surrounding poverty and affordable housing for Jewish people right here in Toronto. Rabbi Frydman Kohl, a supporter of Kehilla's Sukkahville from the outset, celebrated our arrival at Nathan Phillips Square, heralding a new awareness of the problem and the work which Kehilla Residential Programme (KRP) is doing to mitigate it. 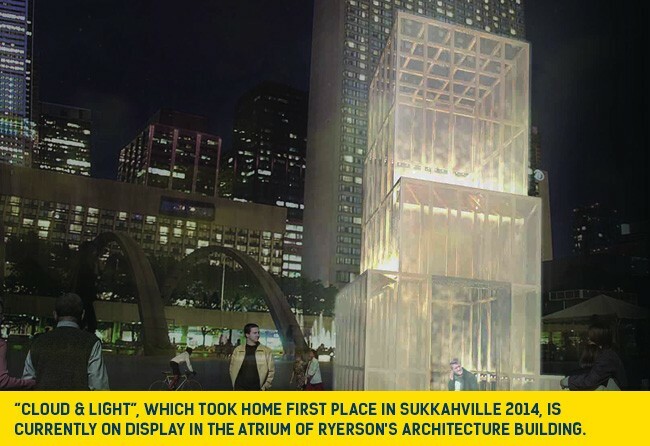 Rabbi Frydman Kohl noted that the site of Sukkahville 2014 was named for Toronto's first Jewish mayor, Nathan Phillips, and said: "Whether it is our simple sukkot or these innovative ones, the vision is the same: to reach from the simple to the sublime, to use the temporary to aspire to the eternal, and to renew the ancient using contemporary creativity. By doing this we sanctify and sustain our lives here on earth." Other informative and inspiring speakers included Adam Vaughan who talked about affordable housing as the solution rather than the problem. In the cooperative spirit of the event, when the Mexican team could not make it, local architect Joanne Frisch constructed "Shield of David" from their plans. Please note that 1st place and People’s Choice Award Winner, Cloud and Light will be on display at Ryerson University’s Architectural Science building until the end of November. For more information, please contact Kehilla Residential Programme at kehilla@rogers.com or (416) 932-1212.